War Wasps are aggressive insects found on numerous planets. They attack by ramming perceived threats with their stingers, though some varieties can attack by firing their stingers. War Wasps reside in War Wasp Hives. Dark War Wasps are Ing-possessed War Wasps. Like the Wasps found on Aether, they can attack by firing a burst of energy at their prey. Ram War Wasps have a hive mind, allowing them to think as one. They rapidly circle around their prey to cause confusion before ramming it. Samus encounters swarms of Ram War Wasps while battling the Hive Mecha. Barbed War Wasps are capable of launching their stingers. Airborne insect equipped with a venomous stinger capable of shearing steel.​ ​The War Wasp rarely strays far from its hive unless it is pursuing an immediate threat.​ It attacks with no regard for its own survival,​ dive-​bombing its enemy with stinger extended.​ Fast-​working toxins from the stinger can incapacitate most small organisms. An aggressive flying insect that will vigorously defend its territory. The royal jelly of the War Wasp queen is so highly valued that hives continue to be harvested on Aether in spite of a shocking death toll. The War Wasp rarely strays far from its hive unless it is pursuing an immediate threat. 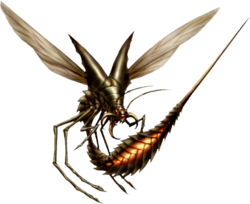 It attacks with no regard for its own survival, dive-bombing its enemy with stinger extended. Fast-working toxins from the stinger can incapacitate most small organisms. If it battles foes at range, it will fire bursts of potent energy. This page was last edited on 19 July 2017, at 02:48.